To say that Tanner Pearson reinvigorated his NHL career after joining the Vancouver Canucks at the 2019 Trade Deadline is a bit of an understatement. Pearson was acquired for what has to be considered a bargain price—the ever-embattled Erik Gudbranson—and proceeded to score at a near 40-goal pace over 19 games with the Canucks. One doesn’t have to dig too deeply into Pearson’s stats with the Kings to see why the organization was willing to part ways with him early on in the season. After a solid 2017/18 in which he scored 40 points, Pearson’s play in Los Angeles regressed hard—to the tune of just a single assist in 17 games. The former 25-goal scorer only managed 24 shots on net—far below his career average. Beyond the surface statistics, however, Pearson had some solid underlying numbers—and the Kings earned significantly more shots on goal when Pearson was on the ice than when he wasn’t. It looked like Pearson might have more to give—but it was also clear that his renaissance wasn’t going to occur in LA. On November 14, the Kings flipped Pearson to the Pittsburgh Penguins in exchange for a slightly-retained Carl Hagelin. If you’re an NHL winger looking to revitalize your career, you could certainly do worse than an organization with Sidney Crosby and Evgeni Malkin down the middle. Unfortunately, Pearson struggled to find success in Pittsburgh, too. His scoring stats did improve—but they still flagged far behind his career averages. Even spending a good chunk of his time on Malkin’s wing didn’t help Pearson score at anything greater than a 15-goal pace with the Penguins. Across 44 games, Pearson’s advanced stats with the Penguins provides a greater sample size than his time with the Kings—and it paints a far less-favourable picture. The Pens were simply more dangerous with Pearson off the ice than with him on it—though his defensive responsibility was noted by observers. All of this culminated in Pearson being flipped to the Canucks in exchange for Erik Gudbranson at the 2019 Trade Deadline. Being acquired for perhaps the least-popular player on the team meant the bar was left quite low for Pearson—but he still managed to clear it by an astronomical degree. 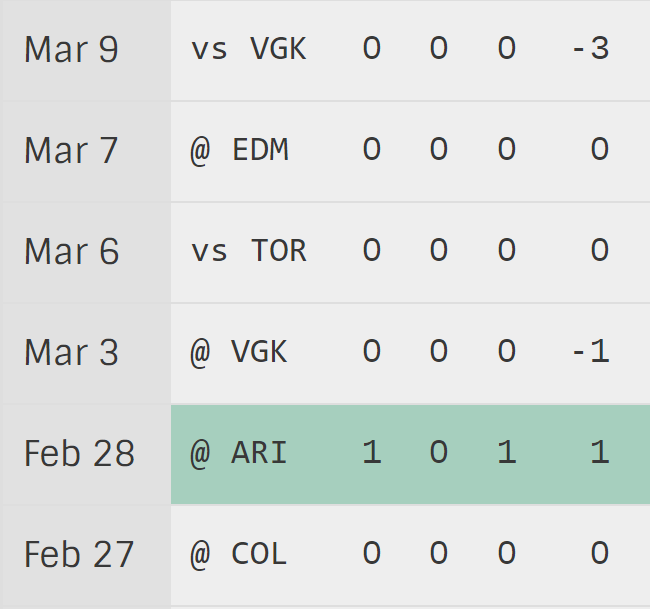 It’s tempting to look at Pearson’s overall statline with the Canucks and assume he was an instant success in Vancouver—but that wasn’t the case. In his first six games with the team, Pearson scored just one goal—in his second game with the team—and zero assists. Once he got his seawall legs under him, however, Pearson truly arrived in Vancouver. More specifically, Pearson found a home on Bo Horvat’s left wing—giving the future Canucks’ captain a consistent linemate for the first time all season. As a result, Pearson’s offense started to pick up and he notched three goals and two assists across the next six games—including three points in a memorable and messy matchup against the Ottawa Senators. Pearson’s final seven games of the season was his best work yet—especially in the goal-scoring department. He scored five times—including a two-goal effort against San Jose—and added an assist. In other words, Pearson scored eight goals and three assists for 11 total points in the final 13 games of the season—a 50-goal pace that is as impressive as it is unsustainable. That being said, Pearson’s numbers weren’t just encouraging on the surface level—and he doesn’t need to keep scoring at such a ridiculous pace to remain a positive contributor to the team moving forward. As previously noted, Pearson began to play regularly on Bo Horvat’s wing—giving both players their first consistent linemate of the season. Across those same last 13 games of the season, Horvat notched 12 points—which would seem to indicate that both players benefitted from one another’s presence. In his short time with the team, Pearson managed to make the Canucks a more threatening team—with their average shots on goal effectively doubling with Pearson on the ice. Similar metrics are difficult to apply to Pearson’s defensive game, as his time with the team coincided with the near-total meltdown of the Canucks’ blueline. It’s also difficult to measure how much of a difference Pearson made to the Canucks. His GAR (goals-above-replacement) and Point Share stats are negligible—but it’s important to remember that he joined Vancouver at a time when injuries had started to take their toll and wins were few-and-far-between. 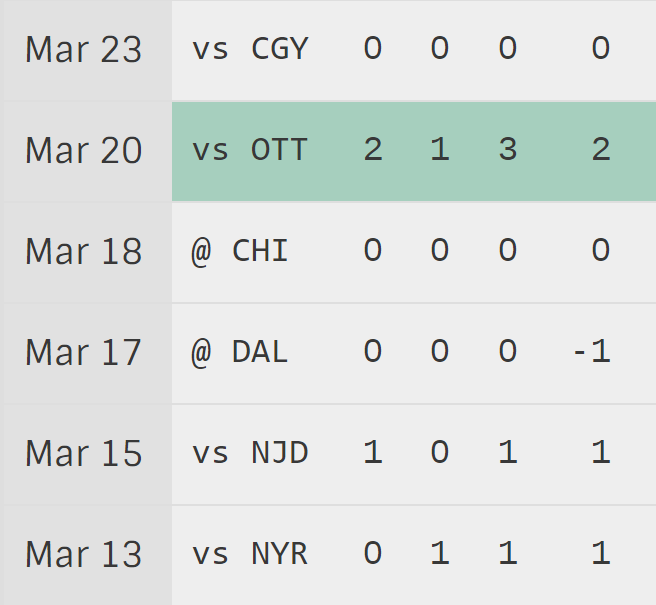 The end result is that—despite Pearson’s prodigious goal-scoring—it’s hard to say that he made much of a difference in the standings. That will, of course, change if Pearson continues to score at such a rate over a full season. As Pearson played in every single game after the Trade Deadline, it’s impossible to determine his WAR (wins against replacement). On an individual basis, however, Pearson’s underlying numbers begin to shine. Riding shotgun with Bo Horvat meant that Pearson started a preposterous amount of his shifts in the defensive zone—58.1% of them, to be exact. That sort of deployment makes Pearson’s scoring rate all the more remarkable. Both of his relative possession scores—whether you prefer Corsi or Fenwick—were positive, albeit barely. Again, that’s perhaps to be expected for a player who starts nearly 60% of their shifts in their own end. Rob Vollman’s Player Usage Chart, which compares a player’s deployment with their quality of competition, places Pearson squarely in the middle of the team. The column in which Pearson really comes out looking like a champ is PDO—a measurement of the team’s combined shooting and save percentage when a player is on the ice. Pearson’s personal PDO of 100.8 ranked seventh on the team and third among forwards—trailing just Josh Leivo and a small sampling of Brendan Gaunce. This number reflects that the Canucks were a lot more successful at the basest component of hockey—scoring and preventing goals—with Pearson on the ice than without. That can probably be attributed to the fact that—oftentimes—Pearson put the puck in the net before his opponents even had the chance to return the favour. It’s difficult to separate Tanner Pearson’s accomplishments with the Vancouver Canucks from the contributions of Bo Horvat. Pearson’s underlying metrics reflect a complementary player—not one who makes an enormous difference on his own—but that’s exactly what Jim Benning was hoping for when he acquired him. The notion that any winger could come in and succeed alongside Bo Horvat is a false one—after all, Vancouver fans had to watch him drag various wingers along with him for much of the 2018/19 season. The fact of the matter is that Horvat benefitted from the addition of Pearson to his line—and, of course, Pearson benefitted from the presence of Horvat even more. Essentially, Pearson proved to be a difference-maker in one important regard—scoring goals. For a team that ranked 25th in the league with just 219 goals, the importance of Pearson’s offense can’t be understated. He brought something to the franchise that it had been lacking—and Canucks fans have every reason to be excited about what he might bring to the table in 2019/20. I think a line of Pearson-Horvat-Sutter is worth a shot. We don’t have a second Top 6 RW after Boeser but Sutter did quite well with the Sedins. Sutter has a good wrist shot, plays a strong two-way game, and can help Horvat on face-offs. Moving Sutter to the wing mitigates his main weakness (i.e. lack of playmaking). All three play a similar physical, north-side, two-way game, on paper I think they would be a good secondary scoring line. Not sure I agree with the Sutter placement on the line, but would love to see Virtanen take it to another level and make that line. IMO Horvat, Pearson and JV are complimentary players and could form an effective 2-way line with some offensive punch. We just need JV to expedite the maturing process. IMO, Sutter is either traded or (preferably) is a 4th line winger who periodically steps in for Gaudette. 100% agree with DogBreath here. Baertschi if he’s healthy (fingers crossed!) or Virtanen are much better bets to provide a positive impact on a line with Horvat and Pearson than Sutter. Until Sutter is traded, we need to find him a spot. I think he’s lost his C position to Pettersson, Horvat, and Gaudette because they have more offensive potential and Beagle seems to be guaranteed the 4C. I’d rather see Sutter in a wing position as an experiment over sure-fire fails like Eriksson or Goldobin. Virtanen would be a good idea with Pearson and Horvat but he still hasn’t put up more than 25 pts. 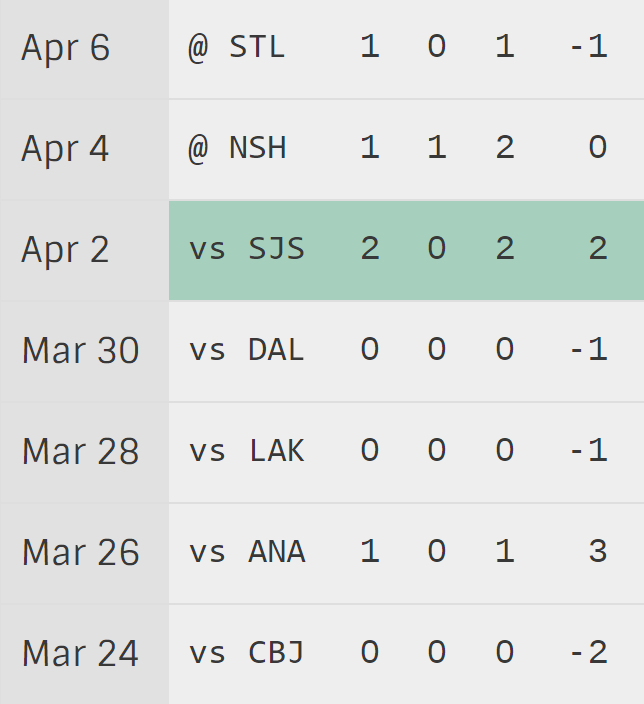 Sutter has 3x 30+ pts seasons and he scored 17 goals each time. I think it would be a fair opportunity to put Virtanen with Gaudette and Leivo or Roussel and give more than 11 minutes TOI (13-15 mins more like it) to showcase more offense and earn a spot in the Top 6. What they really need for Virtanen is to play him with players other than Granlund, Eriksson, Goldobin or Sutter (at centre). An interesting idea, for sure. It could work…but personally, I’m expecting Sutter to be traded in the offseason. Gudbranson was least-popular according to who? This is a completely ridiculous comment, I know that he was much maligned by fans and skewered by the analytics community but he was by all accords a great teammate and a very solid guy in the room. He’s moved on and the trade worked well for both teams for f#ck sakes, enough already. Comments like this where the math-lete writers continually dump on a player reflects why this site has gone down the tube. Otherwise this is a solid article and I love the detailed reports on how our team is doing but you guys really have to find a new punching back and quit pinching one off on a guy that came here and tried as well as he could AND IS NOT ON EVEN ON THE TEAM ANY MORE. Reeks of JD Douche and you are right – it ruins a pretty good post. CA just cant get out of its own way. Really lame, it gets so tiring. Big changes needed AGAIN on this site. 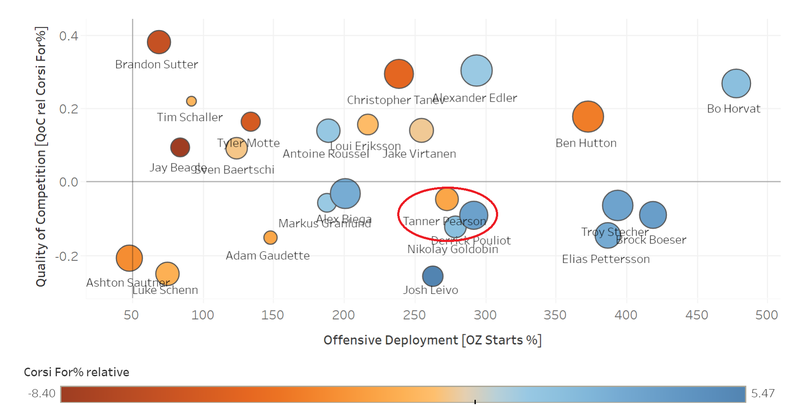 Dying a slow death…..
Tanner is the perfect player for where the team is now. A great pick up. I don’t think you’ll find any other player with statements like that except for maybe Eriksson. Thanks for backing me up! That’s definitely what I meant. I honestly didn’t think that was a controversial statement at all. Since the context was about fan expectations, I thought it was pretty clear that I meant “least-popular with the fanbase.” Loui Eriksson was the only real contender with Gudbranson for that title. First off, you’re a good writer and I enjoy your work. I said in the reply that it was a solid article and I meant it because it was, but the context of that statement wasn’t as clear as you thought it was. Gudbranson clearly struggled here in Vancouver and thus the writers on this site have a proclivity for needlessly piling on. Apparently I’m not the only one that is getting sick of it, but if it was taken out of context and not your intent then let’s move on. I know that you’re not asking for a review but your articles and your willingness to interact with readers afterwards are both really positive and I hope they continue, I’m genuinely looking forward to reading more of your work. It may have been a statement that was, at best, rather clumsy but don’t take it to heart….you aren’t Ayn Rand or Ryan Biech or anything. Keep up the good work, I know it can be thankless due to guys like me but we do enjoy it. So… don’t mention how Pearson was acquired then? So of all the comments to actually reply to, it’s this one…yeah ignore the countless insults and the lack of moderation that has chased so many readers and focus on this one. Nice work. If that’s all that was said then do you think I’d waste my time commenting? You’re not particularly smart, but you are smarter than that. Gino, you must be looking at this on your phone, on a larger screen, the indenting shows he was responding to Ryan. He’s talking about the general lack of moderation of trolls on CA. Specifically PQW and all of his alias. Got that, I wasn’t replying to NVH….clicking reply sent the comment there. And I support NVH’s comment, I’m also curious as to why the lack of moderation towards the same users with limitless aliases is never addressed. Wind your neck in pal. The author *is* clearly referring to the fans and media, who legitimately trashed Guddy over every other player because he was truly awful for the Canucks. Fred – I agree that EG didn’t play well during his time in Vancouver. He struggled most of the time. As a person, he came across as a pretty nice guy. From what I have read he was active in the community and well liked by his team mates. Pearson reminds me quite a bit of Baertschi. When he is not motivated he is invisible and deserves to be benched but when he is motivated he goes into the corners, wins puck battles, takes the puck to the net, sets up his team mates and makes them look good. So which Pearson do we see next season; the invisible one that was dumped by both Pittsburgh and LA or the motivated one that came alive in the last ten meaningless (and irritating) games of the season. Left wing; Pearson, Baertschi, Levio, Roussel, Goldobin, Motte. None of them excellent, all of them capable. Pearson looks nothing like Baertschi and it’s a weird shot to take at two players who don’t lack for effort but for whom injuries played a big role this year. Pearson also reminds me of Baertschi, a bit. I like them both as our top two LW. But Baer in my opinion is the more skilled and dangerous. He was looking good last season before injury and I prefer him with Pete next year. Leivo and Roussel are very capable bottom LWs. Motte is serviceable. Goldy is gone. Baertschi never lacked motivation. He just needed a few years to figure out how to be effective in the NHL and now he can reliably at a 0.53 PPG pace. Pearson has put up even better scoring at 0.63 PPG in his 19 games so I’m not sure why either player’s work ethic is being criticized. What short memories. You don`t recall an uninjured Baertschi sitting in the press box and his concussion problems made him reluctant to pursue puck battles. Pearson was moved by both Pittsburgh and LA not because of injuries but because his production was lousy. Give Rutherford some credit. Like Bowman in Chicago he always had cap problems and had to build a roster mindful of salary constraints ditching competence for cheapies. This Pittsburgh team really needs defencemen. I don’t even know how to engage with someone who would criticize a player who would try and battle to get back on the ice despite concussion issues. You’ve got some nerve and nowhere near the grit that Baertschi showed this season despite the cheap shot that went unpunished. Rutherford has made some great moves and unquestionably deserves credit for getting the Penguins to those two cups since he arrived. But the moves this season are much more questionable. The McCann and Bjugstad trade is great but that was only to rectify turning Klim Kostin and Oskar Sundvist into Ryan Reaves and then Derick Brassard. And signing Jack Johnson for so long is entirely on him. Pittsburgh may need defenseman but they are tied to the one good, 2 medium and 2 terrible ones they have right now for 3 more years. Baertschi; 26 years old, drafted 2011 1st round, best season 18 goals, 35 points. Career 285 games, 66 goals. Pearson 26 years old, drafted 2012 1st round, best season; 24 goals, 44 points. Career 388 games, 87 points. These two could be twins. Yeah, he was scratched for, what, 1 game in January 2017? And Desjardin went on the record saying that it was because he was seeing bad habits creep back into his game. Meaning that Baertschi had been working on becoming a good player, took his foot off the pedal momentarily, got a kick in the pants, and has been a solid Top 6 winger ever since. …his concussion problems made him reluctant to pursue puck battles. There is a huge difference between a player who doesn’t board battle for fear of a career-ending, debilitating head injury (protecting) vs. a player that doesn’t want to put in the work (lazy). Rubbish wojo. Pittsburgh has (elite) Letang, Maata, Dumoulin and Schultz as it’s top two pairings – as good as most in the league. Key injuries and a lack of motivation after already winning two cups are the only real issues with this model franchise at present. I think at least one of those guys has to go in the offseason. Listening to Rutherford,Guddy was acquired because of injuries/lack of RHD at the time. It was a similar lack of RHD depth issue for the Canucks when they acquired EG. Benning added a playoff performer in Pearson,shed MDZ and his cap of $3m and then Guddy and his cap of $4m for the next two seasons while acquiring his RHD replacement for a fifth of the cost. Schenn $800k UFA wanting to re-sign in Van. Not sure how much credit you should give someone for fixing messes of their own creation. I agree but that could be said of most GMs including Rutherford with Reaves-Brassard-McCann/Bjugstad. Wow, I just looked it up, cause I couldn’t believe MDZ’s contract was that rich! Benning gave that chump 3 million per. That in itself could have got him fired, but somehow he convinced Anaheim to take him.Miraculous. Pearson played much of the season recovering from a broken thumb, which almost certainly hurt his performance. The good news is that he has all summer to strengthen his hand. Was going to bring this up KM; but, you have done so. The article is incomplete with this not being recognized in why his performance was so poor for his Pittsberg tour. My advice to the writers on this site. Take the high road. There is no point in slagging a player such as Gudbranson. Point out his challenges..fine. From all accounts (even from detractors) he is a very good person who does a lot in the community. Like Stephan’s stuff normally. The comment on Gudbranson offers nothing at all to this article. By the way, I think this was great work. Well researched and well articulated. The debate over whether it was appropriate to mention Guddy’s unpopularity seems frivolous to me considering a) it was only one line in a long, well thought out piece b) you can argue Guddy’s utility to the team but I think it’s almost impossible to argue his lack of popularity amongst a large group of fans. Whether it was warranted or not is an entirely different subject but there was a definite hatred from many fans. Gudbranson gets mentioned because it creates emotion amongst readers leading to an uptick in hits to the site. This in turn creates more advertising revenue. Gudbranson got mentioned because he was traded for Pearson. A year younger, slightly cheaper and in my view a far better player for this team than Gudbranson (who it’s clear Stephan was saying was a controversial and polarizing player, not that he was unpopular amongst teammates — even EG has talked openly about his trials during his time in Vancouver). I remembered Pearson being a solid if unspectacular complementary player on the Kings and that’s what he seems to have resurrected here. He’s a bit bigger than I remembered and provides the kind of up-and-down the lineup play that we benefited from with the Higgins-type players in his prime. I like Forever 1915’s suggestion of a lineup with him and Sutter on the wings of Horvat IF we don’t end up trading Sutter — which would be my preferred option. The Pens late-season excitement about McCann, Bjugstad and Gudbranson seems to have worn off in the harsh reality of being on the verge of being swept. They all look terrible, especially their D. And they are locked into that D-corps for another 2 years at least. Where are the trolls going on about how amazing Rutherford is again? Though Rutherford has made some questionable moves this season, I believe it’s mentally tough for NHL players to get up for climbing Everest when you have already done it back-to-back and I believe that’s the story of the Pens right now. This isn’t the NBA where teams can dominate for years. Greedy hockey fans need to realise this. Winning thee cup once would be nice! I’m totally open to trading Sutter rather than playing him but let’s be realistic. Sutter’s current value is at an all-time low. Even in his first year where he had the hernia, broke his jaw, and only played 20 games, he still had a better year than last in literally every possible way: goals, assists, +/-, penalties, Corsi, Fenwick, FO%, etc. At $4.375M, you’re not going to get much in return on a trade right now…maybe a low draft pick or C-prospect? It’s better to see if Sutter can get 15-20 goals on the wing this year, restore his trade value, burn another year on his contract, and then rent him next offseason (ala Jeff Skinner) to clear a roster spot and cap space. I appreciate your correct interpretation of my meaning! Cheers. His reconstruction of the Penguins’ defense this year has been bafflingly terrible, though. Granted. The only GM to win Cups with two different teams in the hard cap era. I will say that it is easier to come in and build a SC winner with Crosby, Malkin, Letang and Fleury as your core by adding complementary pieces than starting from scratch. It’s certainly a good starting point, but you can definitely have two of the best players of their generation in your core and mess up a team *cough* Chiarelli *cough*. Though Tanner Pearson didn’t come for free isn’t he a much improved upgrade compared to guys we’ve had here in the past up front? (Megna, Sistito, Leipzic,etc.) Pearson and Leivo I like as middle of the roster Fs and make the Canucks slightly better in this area. Sometimes a guy will go to a particular team and just not fit in but #70 is a keeper, at least for awhile anyways. Benning picked Rutherford’s pocket on the Pearson trade. It seems evident from the data Stephan presents above that he and Bo are a complimentary fit and perhaps after a full season together, this could pay extra dividends come playoff time. Put me in the camp that sees his addition to the team as positive progress on building a better left side. I’m a Benning fan but I don’t really feel like he picked Rutherford’s pocket. Rutherford approached Benning on Gudbranson, Rutherford went on the record as saying that he didn’t know Gudbranson was available until they started talking (i.e. Benning was not trying to trade Gudbranson). Rutherford had already lost his marbles signing Jack Johnson so for him to trade Gudbranson without giving Pearson a healthy chance seems more like Chiarellian incompetence on the part of Rutherford. Let me be the first to say that this data is far from complete, and I’m not exactly a paragon of advanced stats. But I definitely agree that what I could glean is positive! I enjoyed Pearson’s ability to finish. His game clearly fits in with Green’s 3 zone play. Benning clearly had two teams over a barrel in the trades for Leivo/Pearson. This should be an interesting off-season. I enjoyed the article and can follow most except the blobs of red and blue. I don’t even try. Numbers fit my eye better than the hue of red or blue.